Sulphoaluminate cement is a kind of special cement invented by China. It is a kind of hydraulic cementing materials which main mineral contents are anhydrous calcium sulphoaluminate and β-calcium silicate, made from raw materials like limestone, alumina and gypsum, through high temperature calcinations which is usually under 1300-1350 °C, adding different proportions of grinding limestone and gypsum to achieve different performance. The main hydration product of sulphoaluminate cement is calcium stone. With less limestone and gypsum added-which is usually less than 15% of cement weight, the cement forms a quick hardening type with high early strength; with less gypsum but more limestone (15- 35%), the cement has acquired low alkalinity; While with more gypsum, it becomes a self-stressing cement with swelling properties. Sulphoaluminate cements vary according to the variety and grades. The main technical requirements include physical properties like specific surface area, hardening time and swelling rate, alkalinity and alkali content. 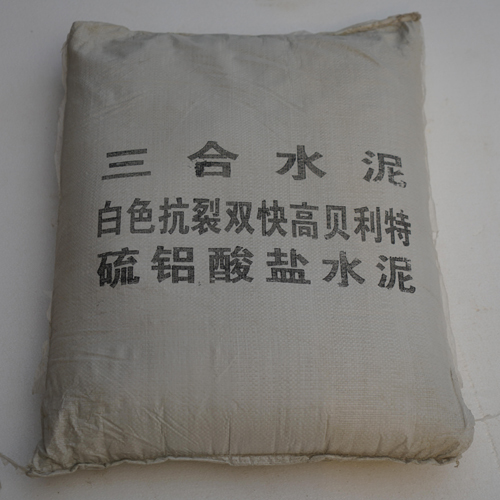 Sulphoaluminate cement has the characteristics of fast setting and hardening, high early strength, low alkalinity, micro-expansion and self-stress. It is usually used in quickly repairing concrete, winter construction projects, GRC products and self-stressing pipes, etc. It also can be made into sulphoaluminate type expansion agent and a waterproofing agent used in ordinary cement concrete. Sulphoaluminate cement is also widely used in the field of mortar. It can be made into a quick plugging agent with its fast condensing performance for it can set in 3 minutes and block the leakage of a certain pressure within 4-6min; using its high early strength and micro-expansion properties to make high-strength grouting material and fast-hardening ground self-leveling mortar; at the same time, there are also certain applications in the thin plastering exterior insulation system adhesive and plastering mortar, tile joint and caulking agent.